July 2018: Agawa Bay is a radio site on the eastern shore of Lake Superior. The site consists merely of the Agawa Scenic Lookout, a parking lot with two benches, overlooking Lake Superior from above, just across the Trans-Canada Highway. The lookout is 60 miles (95 km.) north of Sault Ste. Marie and 140 miles (225 km.) northeast of Marquette. Because of its location, it's possible to receive Lake Huron lake tropo under the right conditions in addition to primary stations over Lake Superior. The lookout was right inside the lake duct on this day with massive local-strength signals in excess of 200 miles. July 2018: Chippewa Falls and nearby Batchawana Bay are radio sites on the southeastern shore of Lake Superior, 35 minutes north of Sault Ste. Marie. The falls consists of a roadside park with a plaque indicating the halfway point of the Trans-Canada Highway, while Batchawana Bay Provincial Park, 6 miles (10 km.) to the west, is a thin strip of beach and parking. Northern Michigan, Sault Ste. Marie, and Marquette are common here. During ideal conditions, the location of this site and the orientation of its shoreline is favourable for lake tropo originating from across both Lake Michigan and Lake Huron in addition to usual Lake Superior signals. August 2018: Brimley State Park is a radio site along Whitefish Bay in the southeastern corner of Lake Superior just outside Sault Ste. Marie. Its position along the bay protects it from Lake Superior's often-harsh conditions, but also somewhat shields it from the primary lake breeze circulation that fuels lake signal propagation. The site is beside Waiska Bay, a bay within the larger Whitefish Bay, and is at the mouth of St. Marys River leading to the Soo Locks. In addition, it is at lake level with no real elevation, therefore under the lake's atmospheric ducts, further hampering reception. Brimley is in the Sault Ste. Marie market and commonly receives Sault Ste. Marie and Northern Michigan stations locally, as well as Wawa (110 miles north), Thunder Bay (260 miles northwest), Houghton (195 miles northwest), and Marquette (135 miles west). Both night enhancement and daytime lake tropo were monitored at this location. July 2018: Copper Harbor is a radio site on the northern tip of the Keweenaw Peninsula in the Upper Peninsula of Michigan. The Keweenaw Peninsula juts out 35 miles beyond the average southern coastline of Lake Superior. Copper Harbor consists of two radio sites: the upper, including Brockway Mountain, 728 feet above the lake, and the lower, including both Astor Shipwreck Park (day) and Fort Wilkins State Park (night), at or just above the water level. Because Lake Superior's ducts are significantly higher in elevation than the other four lakes with warmer water temperatures, the two sites provide a valuable comparison of reception between lower and higher elevations in this area. Copper Harbor is near the centre of the lake's southern shore, 180 miles northwest of Sault Ste. Marie and 200 miles northeast of Duluth, as well as locally 85 miles southeast of Thunder Bay and 70 miles northwest of Marquette. Typical reception at this site includes Duluth, Minneapolis, Bemidji, International Falls, Thunder Bay, Marquette, Northern Michigan, and Northwoods Wisconsin. April 2017 / Off-Season: Duluth is a radio site at the westernmost point of Lake Superior. It consists of Duluth, Minnesota to the north and Superior, Wisconsin to the south, together referred to as the Twin Ports. The city is well-known for its 17 radio towers that dominate the skyline, a beacon visible from 20 miles (32 km.) away alerting locals that home is near as they travel into town. Due to the shape of the coastline here, the terrain blocking the city into the marine layer where few stations lurk, as well as the aforementioned cluster of towers, home to 22 stations immediately overlooking downtown - almost the city's entire local radio dial - reception here is the worst of any spots on the Great Lakes, an average distance of just 27 miles with few out-of-market stations audible within the city. While reception here is primarily from locales nearby, the strongest of the Minneapolis signals are very common in the higher elevations surrounding Duluth as well as along the lake just to the east of town and other inland markets can be heard with good conditions. Despite its location beside Lake Superior, Duluth is chiefly governed by inland propagation. August 2016 & April 2017: Grand Sable Dunes is a radio site in Michigan's Upper Peninsula. The site is one of very few on the southeast stretch of Lake Superior's shore with significant elevation to utilize the typically higher ducts over the lake. The 300-foot dunes are immediately to the west of Grand Marais (a city of the same name exists across the lake in Minnesota) and are part of the Pictured Rocks National Lakeshore. In addition, Agate Beach in Grand Marais, 6 miles east of the Log Slide Overlook site at the dunes, is used as a low elevation site for comparison. The dunes are between Sault Ste. Marie - 85 miles to the east - and Marquette - 60 miles to the west. Thunder Bay is 190 miles to the northwest, Wawa 110 miles to the northeast, and Traverse City 130 miles to the south. Typical reception here is from Sault Ste. Marie, Marquette, Thunder Bay, Northern Michigan, Green Bay, and Timmins. Stations from across Lake Michigan, including Milwaukee, are also relatively common within 10 miles of this site. July 2018: Kama Bay Lookout is a radio site on the central north shore of Lake Superior. 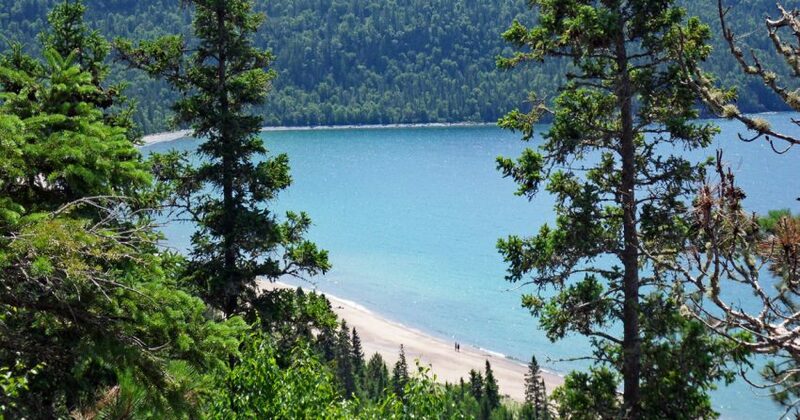 It is located 12 miles east of Nipigon at the furthest northern extent of Lake Superior. Right in the centre of the lake's north shore, it is 240 miles northwest of Sault Ste. Marie and 240 miles northeast of Duluth on either side of the lake, 170 miles north of Marquette, and just 70 miles northeast of Thunder Bay. The lookout is 360 feet above the water, placing it in the range of the strongest lake ducts, and has sweeping overlooks of Kama Bay. Behind it are the Kama Hills with cliffs towering up to 900 feet above the highway below. Typical reception at Kama Bay includes the Upper Peninsula, Northwoods and Central Wisconsin, and Northern Michigan. July 2018: Marathon is a radio site on the north shore of Lake Superior. The site consists of both Pebble Beach at lake level in town and Gchi-Waaswaaganing (combined into a single map), 400 feet (120 m.) higher and inland, just outside of town. Marathon, with 3,300 residents, is the centre of business in this area with an economy based historically on pulp and gold mining. It lies 155 miles northeast of Marquette, 180 miles northwest of Sault Ste. Marie, 130 miles east of Thunder Bay, and 300 miles northeast of Duluth. Due to the distance of these nearest radio markets, reception here has an average distance of 191 miles (307 km.). April 2017 / Off-Season: Marquette is a radio site on the central south shore of Lake Superior. With 20,000 residents, it's the largest city in Michigan's Upper Peninsula. It lies 145 miles west of Sault Ste. Marie, 225 miles east of Duluth, 70 miles southeast of Houghton, 155 miles southeast of Thunder Bay, and 150 miles northwest of Traverse City. The city has 20 local stations, though half lie outside the downtown area. Typical reception originates from Escanaba, Houghton, and Northern Michigan. July 2018: Michipicoten is a radio site on the eastern shore of Lake Superior with the longest open water path on the Great Lakes, an uninterrupted 350 miles to Duluth, 50 miles longer than any other Great Lakes path and passing just a mile offshore from the Keweenaw Peninsula at Eagle Harbor. The site pairs Government Dock Beach at water level with the Michipicoten Scenic Lookout just up the road, 165 feet above the lake. Wawa, the region's commercial hub, is 10 minutes to the north. Three bandscans were conducted at these locations. A late evening bandscan was performed at Government Dock Beach and then the lookout immediately after; both are combined in a single map. The scans were done at a time after the main lake breeze circulation had ceased for the day but before nighttime enhancement had begun. For comparison, an additional scan was performed the following day during daytime lake tropo at the lookout. August 2018: Miners Castle is a radio site on Lake Superior's south shore in the Pictured Rocks National Lakeshore. The site is 7 miles northeast of Munising in Michigan's Upper Peninsula at one of the most well-known cliff formations of the Pictured Rocks. Miners Castle is 40 miles east of Marquette, 100 miles west of Sault Ste. Marie, 125 miles northwest of Traverse City, 180 miles southeast of Thunder Bay, and 265 miles east of Duluth. The site, unlike most with any elevation on the south shore, is readily accessible by car. Because of its location, Miners Castle can also receive stations from across Lake Michigan in addition to those from across Lake Superior. July 2018: Nokomis is a mountain trail radio site, 400 feet (120 m.) above the water on the east shore of Lake Superior. The site is the only Great Lakes bandscan site on a mountain trail and the only site requiring a long hike to access. Nokomis Trail is located at the northern extent of the massive Lake Superior Provincial Park just 15 minutes south of Wawa and ten miles southwest of the Michipicoten bandscan site. It lies 90 miles north of Sault Ste. Marie, 145 miles northeast of Marquette, and 200 miles across the water from Thunder Bay. Northern Michigan, the Upper Peninsula, and Northwoods Wisconsin are all common at this site. July 2018: Ouimet Canyon is a radio site along Lake Superior's north shore. Lying anywhere from 6 to 12 miles inland and at 720 feet (220 m.) above the lake, the canyon is 165 miles northwest of Marquette, 260 miles northwest of Sault Ste. Marie, 210 miles northeast of Duluth, and just 30 miles outside Thunder Bay. The site is remote yet scenic and is a valuable look at how signals from across the water propagate inland at higher elevations, funneling into the canyon from the southeast. July 2018: Palisade Head is a Minnesota radio site along the northwest shore of Lake Superior. The site, which may be among the most magnificent along the lake, is just 55 miles northeast of Duluth and 115 miles southwest of Thunder Bay. Despite its more crowded dial than other locations along the north shore, still hearing distant stations - it's 185 miles northwest of Marquette and 330 miles northwest of Sault Ste. Marie - is almost expected here. This site, by a scheduling quirk only, was monitored on two separate days. On both days, reception easily topped 350 miles into Northern Michigan as if one were listening instead from the Batchawana Bay site. Expect regular reception here from Northern Michigan, Marquette, Green Bay, La Crosse, and Minneapolis. July 2018: The Susie Islands Overlook is a radio site on the Minnesota side of the U.S. - Canadian border. It lies within the very rural Grand Portage Indian Reservation, 3 miles west of the border. At 430 feet above Lake Superior, it is an easily accessible roadside site overlooking Wayswaugoing Bay, the nearby Susie Islands, and Isle Royale, 20 miles to the southeast. The site lies within local range of Thunder Bay, 30 miles to the northeast, and Houghton, 75 miles to the southeast. Marquette is 145 miles to the southeast, Sault Ste. Marie, 270 miles to the southeast, and Duluth, 140 miles to the southwest. July 2018: Terrace Bay is a radio site on the central north shore of Lake Superior. The site is 100 miles east of Thunder Bay, 150 miles north of Marquette, 200 miles northwest of Sault Ste. Marie, and 270 miles northeast of Duluth, making it one of the most remote sites along the shores of Lake Superior. The town of 1,400 is historically built upon the pulp industry, as many in the region are, and is home to a 50-foot lighthouse model constructed in 2011. The town is the only bandscan site on the Great Lakes to top an average reception of 200 miles, meaning half the radio dial originates from locations a distance of 200 to 370 miles away. Because of its location directly across the water from the narrowest section of Michigan's Upper Peninsula - just 40 miles across - Terrace Bay can also tap into the Lake Michigan radio dial with the presence of satisfactory conditions. July 2018: Thunder Bay is a radio site in northern Ontario. It is the largest city on the north shore of Lake Superior and the centre of commerce for the region. It lies 150 miles northwest of Marquette, 260 miles northwest of Sault Ste. Marie, and 175 miles northeast of Duluth. The site utilizes Hillcrest Park, a popular park 150 feet above Lake Superior in the city of Thunder Bay and the more favourable Terry Fox Monument and Lookout 4 ½ miles to the northeast on the edge of the city at an elevation of 265 feet above the lake. Due to the proximity of local stations in town, radio overload can be a common issue at these locations. July 2018: Whitefish Point is a radio site on the far southeast shore of Lake Superior. The home of Whitefish Point Lighthouse, it is in Michigan's Upper Peninsula and sticks out as a peninsula at the entrance of Whitefish Bay. The point is at lake level, meaning it lies below all atmospheric ducts responsible for the propagation of signals over the water and is prone to sporadic signals and "fallout" from ducts above. The site is just 30 miles northwest of Sault Ste. Marie, and is 85 miles south of Wawa, 230 miles southeast of Thunder Bay, 115 miles east of Marquette, 170 miles east of Houghton, and 140 miles northeast of Traverse City. Typical reception on this stretch of shore includes Sault Ste. Marie locals, Marquette, Houghton, Northern Michigan, Wawa, Thunder Bay, and Timmins. Future bandscans planned for this lake: Lake of the Clouds is the final Lake Superior bandscan, planned for the summer of 2019. An additional scan at Marquette is planned to replace the existing off-season bandscan.